A thrilling alternate take on the dark knight that fans of the DC Animated Universe will enjoy. The late 80’s saw some pretty cool releases for DC Comics as they were placing different takes and spins on some of their most popular series in “The Elseworlds” line of books. One of the most notable entries (and also the first) was the Gotham by Gaslight comic series by Brian Augustyn and Mike Mignola (before his Hellboy fame) that saw the dark knight placed in the 19th century and taking on Jack the Ripper. 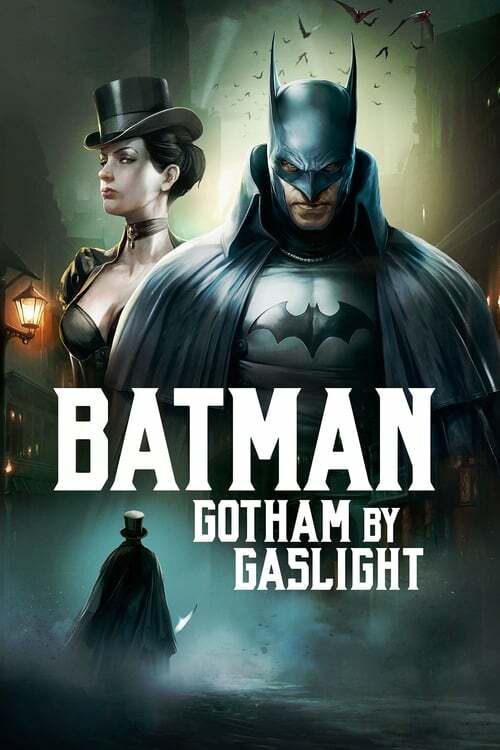 The DC Animated Universe has been releasing some of the more popular comic events recently such as their take on The Killing Joke, and has now brought us Batman: Gotham by Gaslight. It’s a dark, thrilling tale that focuses more on Batman’s detective skills and allies this time around which makes for a bat-tastic time for all viewers. Taking place in 1889’s Gotham, there’s been a string of murders in which prostitutes and women are involved by Jack the Ripper, and Bruce Wayne/Batman (Bruce Greenwood) is on the case to put a stop to them. No matter how close it seems Batman gets to taking him down and solving the mystery behind the murders, Jack is always a few steps ahead. This changes when Selina Kyle (Jennifer Carpenter) looks into finding and killing Jack herself, though of course this leads to her bumping heads with Batman who doesn’t want her involved. We all know how stubborn to the two of them are, and they eventually work out their differences and join forces to take Jack down. But when Bruce is framed for the murders and arrested some time later, it will take all of his friends and allies to aid him and stop Jack once and for all. Being a big Batman fan, I already knew I was going to enjoy this before watching and I’m glad it didn’t disappoint. I really liked the old time setting and how Batman was more like a superhero version of Sherlock Holmes in this film. I also thought the “twist” ending was fun despite seeing it coming, and I liked how Bruce Greenwood and Jennifer Carpenter played off each other really well. Much like some of the recent DCAU releases, this too is rated R for some minor swears here and there, but most notably the violent and gruesome murders that take place. I was really surprised this was released on 4K UHD Blu-ray, but it’s a welcomed treat as everything looks and sounds as best as it can thanks to HDR color and Dolby HD audio. When you’re done prowling the streets by gaslight, there’s some special features to sort through, starting with audio commentary by executive producer Bruce Timm, director Sam Liu and writer Jim Krieg. Here they discuss bringing the 1989 classic to the small screen, how they went about making it happen, and more that makes for a nice listen. There’s also a sneak peek at the next DCAU movie “Suicide Squad: Hell to Pay” that looks to be fun, “Caped Fear: The First Elseworld” is a nice extra that has Bruce Timm and some other crew members covering the history of elseworlds comics and how the movie brings it to life. Rounding out the extras are two bonus Batman show episodes “Batman: The Brave and the Bold – Trials of the Demon!” and “Batman: The Animated Series – Showdown” which are always fun to look back on and watch again. Batman: Gotham by Gaslight is dark, thrilling, and most of all entertaining take on Batman set in the late 19th century that fans and newcomers are sure to like. It helps that the main leads have great chemistry, the visuals and audio are great thanks to a 4K release, and especially the awesome special features that are worth the price of admission alone. So go ahead and pick this one up and get ready to have a gas with the Batman.